Prime Mouthbreather’s just Another in the conga line of unflinching Hypocrites – Good pick up Jelmech! Oh that”s too good! And why I pay for a subscription here and not for Domeinfax. Similar to when Malcolm wrote an article about negative gearing tax advantage and the dangerous property bubble tied to China in 2010. Only to defend it a few years later. so, exams going well then. The lying from the career politicians at the major parties is systemic . There are plenty of good independents and a couple of good minor parties out there. Put the parties major parties last. He really is an excellent liar. That’s because he believes his own drivel. I haven’t seen it myself (we don’t have tv), but I suspect they only used the missus’s “where are their jobs in the country? We’d love to have some of those ourselves” comments, rather than the more nuanced stuff we gave them. At least the MSM seems a little bit interested. Let’s hope some of the MSM journos quote ScoMo’s 2011 comments to him and watch him squirm. We need some sort of integrity watchdog with teeth. People are getting sick and tired of being treated like idiots by members of parliament, Local, State and Federal. It is a game of revolving musical chairs. The Voters get so dizzy they fail to see the parties are just 2 sides of a whole. The 2 major parties are there to protect the interests of the Owners. The only “Watch dog” that’ll be in any way effective is, Us,… “We the People” taking control of what ever party or group of parties rule,…no Decision making politician can be fully trusted,…they need to be kept on tight leashes held by the comon people/members of the parties they represent. Its Our job,…all of us,…to participate more, bear witnesses and when required speak up, censure and if require roll self serving behaviours. The most Ambitious and successful (often sociopaths) need firm guidance from simpler folk like the MB Commentariat and wider community. The most Ambitious and successful (often sociopaths) simply find more and better ways to sidestep same and do as they please. It’s almost like he’s nothing but a lying prick who’ll say whatever he thinks will benefit him at any given moment, isn’t it? Yep and by definition a psychopath. Either that, or so out of touch with reality. They listen to their party machine who also seem to have no clue of what the people are going through, or don’t care. At the end of the day the worst is they go to opposition, and not much changes for their lives. Some get kicked out, but end up with jobs for the puppet masters who ever they maybe, corporate or union. No consequences that we have to live with that’s for sure. 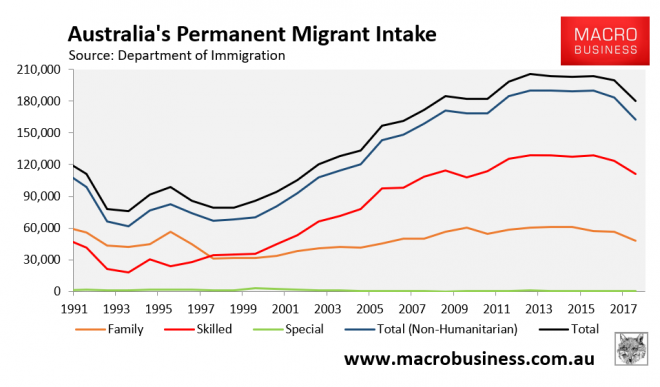 Our lowest immigrant numbers in a decade is being bandied around a lot by the LNP at the moment but I hear none from them or in the media making the correlation between this and falling property prices. On a side note, but connected …I tuned into 2GB on the way to the Opera house protest last night and Ross Greenwood was talking callers about this “move em to the bush” brain fart and this Indian fellow who announced himself as a recent arrival was talking about skilled work visas and how “They” all work in Sydney and Melbourne,….Ross goes of on a jibe about how these people spend money into the economy, provide employment and buy Property which is good for the economy. Ross quickly takes the next caller. Watch out for a mass exodus of immigrant property investors if the property market goes belly up. Anyone who thinks they’re going to stay to be left holding the bag for the banks is living in la la land. It’s literally a daisy chain waiting to happen in the outer suburbs of Melbourne I noticed. That will also flow on to all the massage shops and dodgy restaurants with no-one in them. Uber Eats must be taking a hit too. Yes, have had a couple of skilled migrants say the same to me. I wish I could laugh, but it’s 3rd world slum lord’s like this that have pushed the cost of housing up for everyone. No wonder I resent them being here. When I hear stories like this or talk to cab drivers on the way back from the airport (Indian) who complain about the Chinese buyers (keeping them out of the game). Yet when spoke to an ex-HK / Chinese cab driver she tells me she hates what mass immigration is doing to Sydney. She said their turning it into HK. Too many people and too many apartments and prices far too high. She arrived 20 years ago though. Where as the Indian blokes are all within the last few years. +1000 again Gav, why do I love you so much. All of my friends growing up were either ABCs or 2nd gen from HK/Taiwan/Korea (Inner West Sydney) and they are the ones who clued me in on what uncontrolled immigration was doing to the place. Oh the prodigious irony. Escapees from third world shitholes complaining about their compatriots following them and turning our country into a third world shithole and buying up all the real estate to become slumlords. My arse just fell off. Guys, don’t mention the Indians, you know the comment section will get shut down, if we do. For some reason, Indians are a protected group. The collapse is baked in, whether it’s slow or fast, all governments have worked tirelessly for decades for this result. I’m going to laugh at all the hard luck stories. Oz is going to become ever more angry, hateful, divided. Down, down, down. This is going to be sooooo funny. Oh dear, how rotten of me. Glad I’m not a Believer, I can be honest. The irony. hahahahahaha ! Meanwhile enjoying the show, vote Sustainable Australia in the SENATE as either your first or second choice. We need a sane voice in there. It’s much worse than that Skreese. That the ABC acts as a mouthpiece for Urban Taskforce is reprehensible. Media watch? Oh wait a minute…..
Can’t see them giving Leith an opinion piece …….his opinion doesn’t go with the agenda . Yeah only SkyNews which is apparently for Nazi’s..
Sky featured the Morrison backflip last night. Ah the Bush. In Woop Woop there’s such a high demand for car washers, coders, taxi drivers, pizza shop workers, help desk operators who are fearful of answering a call or an email without using a template, fly by night ‘education’ specialists, call centre operators and real estate agents. Yes! The social implications of what this would eventually look like don’t bear thinking about. Tell you what, i could get on board with this whole ‘Migrants to The Bush’ thing provided said Bush Migrants got a bounty attached if they were found outside of town/city limits. Think of all the rural bounty hunter employment opportunities, it would be like ‘Bogan Hunters’ but with more diversity and fewer sick Commodore wagons. Downside is of course that they’d then add ‘Visa Breach Bounty Hunter’ to the skilled occupations shortage list, and the imports would be so much easier to bribe. But I might add, with Amazon moving in, we need more StarTrack drivers from overseas. Stat!